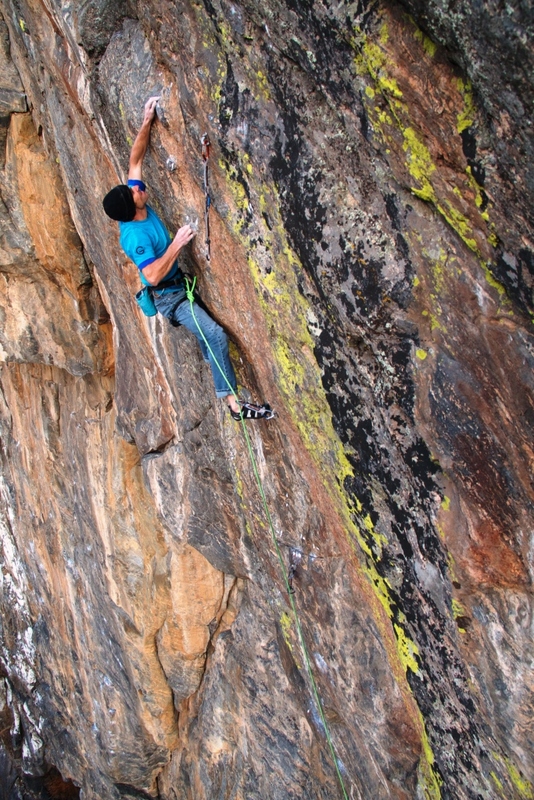 Last spring I climbed Mission Overdrive in Clear Creek Canyon, a linkup that begins up Daniel Woods’ 5.14c(/d?) 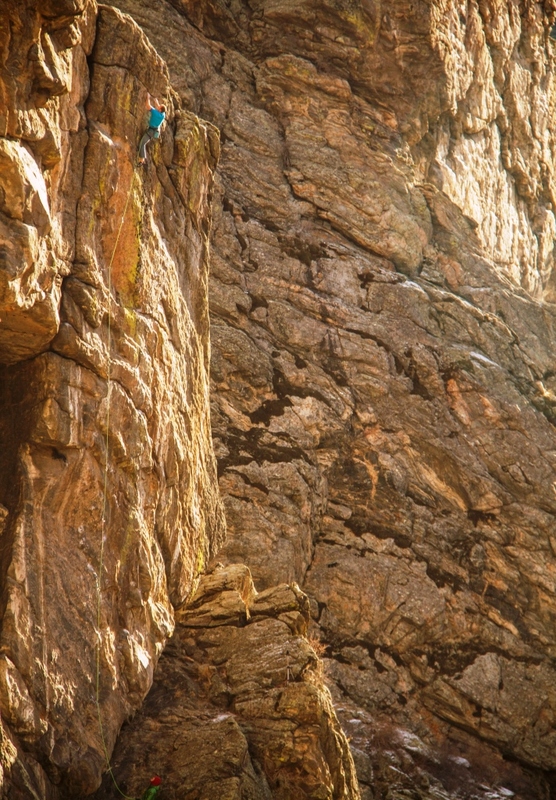 test-piece Mission Impossible, and then traverses right at mid-height to catch the upper half crux of the canyon’s mega-classic 5.13d Interstellar Overdrive. At the time I was curious to investigate the complete Mission Impossible, but the remainder of my season was already booked solid. After returning from St. George in mid-January I decided to focus my attention on Mission Impossible. I had worked out the first half the previous spring, so I focused on the upper half. Where the lines diverge, an easy jug rail leads left to a great rest, followed by about 15-feet of easy 5.12 climbing. Above this lies the crux, composed of two back-to-back boulder problems separated by a relatively big, incut horn. I was able to suss the first boulder quickly, but the second was completely baffling. The holds essentially disappear, leaving about a 6-foot gap from a slopey 1-pad edge just above the horn, to a series of arcing horizontal slashes that traverse the lichen-streaked headwall. There was no chalk and no hint of a sequence between these holds, only a few slippery pegmatite micro-crystals. However, there were many footholds below the void, and a 2-foot tall depressed channel running horizontally across the left side of the wall, the bottom half of which formed a short, 75-degree slab. This mini-slab had a few imperfections, ripples really, that provided just enough relief to offer the scantest purchase. On a vertical wall these ‘razor crimps’ would be pitiful footholds, but situated on the slab, with good footholds below, they presented potential. After half an hour of thrutching I discovered a desperate sequence of slaps between the razor crimps, followed by a burly rockover onto the incut horn, and finally a precision stab to the distant horizontal slash. These were hands-down the hardest moves I’d ever climbed on real rock. It was hard to imagine linking this boulder problem after 60-feet of pumpy climbing, but experience told me that if I could do the moves, eventually I could build the muscle memory and fitness needed for a redpoint. Over the next couple days I rehearsed and refined my sequence, battling the canyon’s fickle conditions. Finally, on the fourth day of work I redpointed up to the lowest razor crimp, but failed to stick the second. I was able to bag my first one hang, and then on the next burn I made it one move further, falling going for the third crimp. Two 1-hangs in a day, I was stoked! This was going better than I expected. I spent the rest of the burn trying to link into and through this crux from as low as possible. It was hot, and I was struggling, but each time I managed to pull through. After one link, I noticed I had sliced a thin layer of skin off my right ring finger pad. The second razor crimp has a jutting crystal positioned between the middle and ring fingers, and it was cutting harshly into my ring finger. I foolishly persisted, and on the next link this scalpel sliced completely through. My journal entry for the day summed it up perfectly: “Blood everywhere. Didn’t have any tape with me, and wasn’t ready to quit, so I tried to find another way to use the right hand there, and in the process managed to make the finger pad worse. Totally fucked now”. 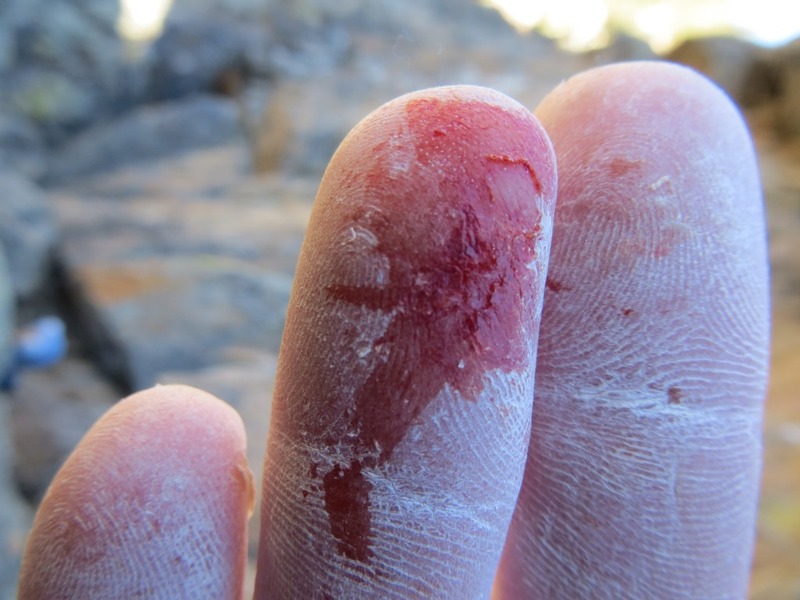 I took a few extra rest days, and then taped my mangled finger the best I could, but I struggled to match my previous efforts over the next few climbing days. By the end of January, with bitter cold temps and snow on the horizon I decided to retreat to my hangboard and let my wound heal. Finger pad carnage! I can smile about this now. After five weeks of solid strength and power training my skin was perfect and I was ready to get back on the horse (this time with a roll of tape threaded onto my chalkbag belt!). At the end of my first day back on the route I shocked myself by redpointing up to the incut horn. I struggled to repeat the razor crimp moves – perhaps my power was lacking, but my fitness was far beyond my expectations. I felt a bit more limit bouldering and campusing was in order, so I returned to the Lazy H for one more power workout. The next day on the route, the second of the season, I matched my previous highpoint on the first burn, and then made it one move further, to the highest razor crimp, on the next burn. Once this crimp is secured, I throw my right foot high onto the incut horn, and make a long stab to the first horizontal slash. On this burn I snatched for this slash, touched it, but wasn’t close to latching it. Still, after falling on redpoint six times at the razor crimps, I’d finally made some quantifiable progress. Learning from the previous season’s disaster, I quit while I was ahead. I was feeling confident, but also, quite suddenly, I felt a wave of pressure – now I knew the send was close at hand, and I would need to climb at my best over the coming days. I spent two stressful rest days obsessing over the beta, my skin, and my diet. Hardly a moment passed without thinking about the route or my preparations. This kind of stress is not pleasant, but I think it actually helps. Many athletes talk about performing their best when they feel ‘butterflies in their stomach’. It conjures the fight or flight response that taps into our body’s ultimate strength and endurance. But where technical precision is required, it can certainly be an impediment, resulting in jittery foot movements and poor dynamic control – it’s a precarious balance. 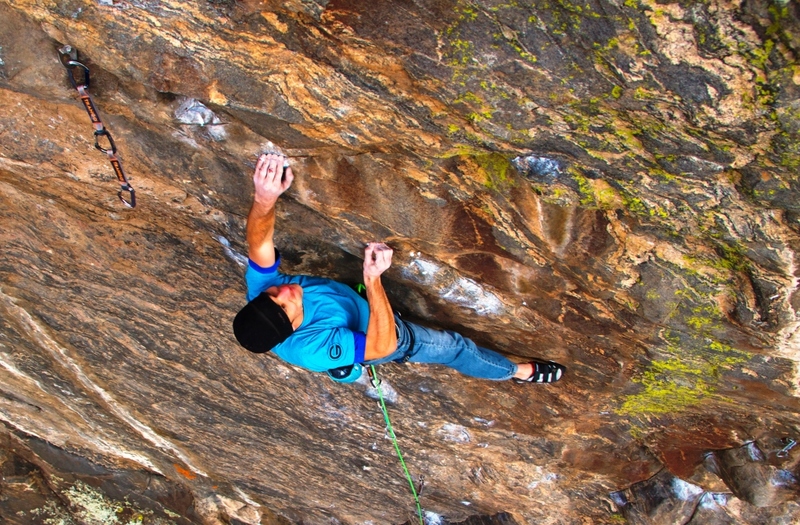 Finally it was Sunday, time to go climbing again, and another opportunity to clinch my goal. It was cold with a slight breeze, nearly perfect. I climbed smoothly up to the mid-way rest, shook out my hands for several minutes and tried to warm my numb finger tips. Eventually I ventured upwards, latching each crimp with relative ease. I felt great. I latched the highest razor crimp, and rocked up on my right foot with only a moderate pump. Perhaps I was overzealous, or just unprepared to feel so collected, but I lunged wildly for the horizontal slash, over-shooting it by a few inches. I was able to find the hold but not control my now-downward sailing momentum. I managed to grunt out a pair of expletives during the long descent onto the rope. I had it, I felt fine, I should have stuck the move easily, but instead I panicked. It was frustrating, but still, it was my best burn so far, and I was now very close. Clearing a small roof just below the upper crux. Photo Adam Sanders. By the time I was ready for my second burn, the crag was teeming, and a small gallery had formed, including strongman Jon Cardwell, who was patiently awaiting his turn on the route. 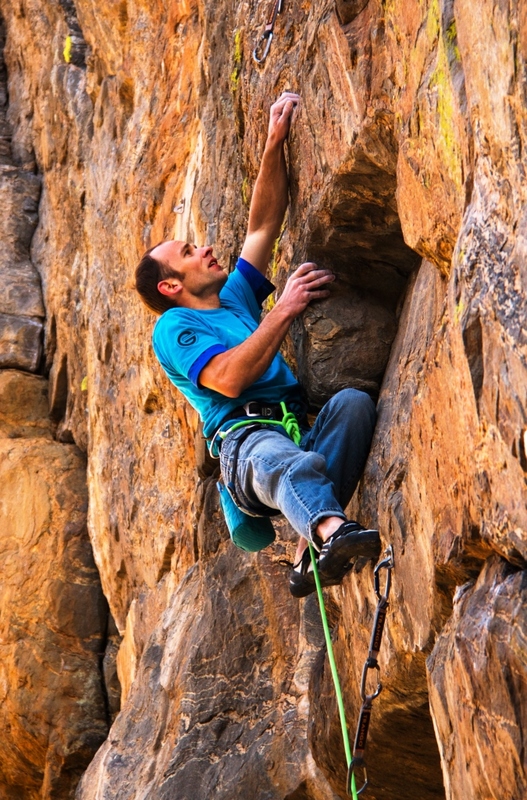 Jon is originally from Albuquerque, and I watched him develop into one of the best young climbers in the country during my seven years climbing and training at Stoneage Climbing Gym in New Mexico. It was oddly inspiring to see us now working the same route (although I imagine he’ll find it much more accessible than I 🙂 ). The first half was merely a formality by this point, and I quickly worked up to the midway rest. I thought through my sequence, recalling how to grip each hold, when and where to shift my weight, and preparing my mind for a struggle through the final headwall. Once I could feel my fingertips again, I cast off. I cruised to the razor crimps, feeling only the slightest pump. I moved methodically from edge to edge, not statically, but with complete control. The moves had never felt so easy. I targeted each hold, and reeled them in, one after the other. Finally I rocked up onto the incut horn, preparing to dyno. I delayed for a moment, and then coolly –and statically – reached up to the horizontal slash; gotcha! I danced powerfully up the final eight moves, my excitement building as I neared the lip. I clipped the chains, unleashed a loud yodel, and mantled onto the summit. Mission accomplished! Awesome send. Inspirational even though I am only barely thinking about climbing 12a. Makes me want to get outside and try something hard. Mark, to put a selfish spin on your success, I must say that your send is inspiring. 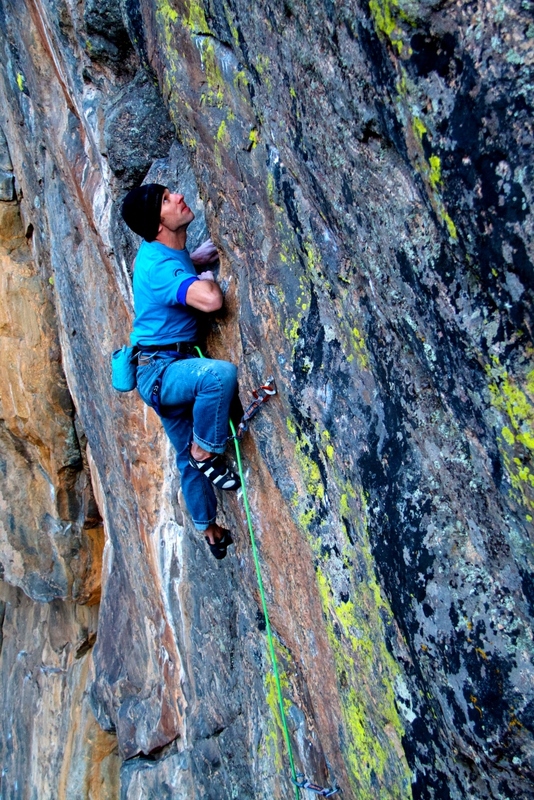 I started climbing at age 25, fell in love with it fast, and hit a plateau shortly thereafter at age 27. Once I turned 30, I began to worry that I had already passed my peak athletic potential at a [relatively] young age and further progression simply wouldn’t happen. This fall, I decided to start training for climbing and turned 31 this January. Like you, I have a career (in the medical field) and a young family (our latest addition made his appearance on November 4th). To see that you, in your 30’s, have just redpointed your hardest route to date while caring for a family and working full time gives me hope. Thank you for sharing your success, and many congratulations on your send. Thanks Chris! That means a lot to me. Best of luck to you! Thanks Mike! I definitely felt like everyone was pulling for me, and I think it helped. …And if anything the cold weather is a positive, but it does take some getting used to…and handwarmers in the chalkbag! Excelente, realmente estas hecho un buey, espero que sigas progresando y escuchemos de ti mas veces. Excelent, actually you are strong like an ox, I hope you keep progressing and listening about you more times. Inspiring story Mike!!! It’s very cool to read about your redpoint process on all of these routes, to compare it to my own and to hopefully learn something from it. I just turned 30 and sent my first 14a this year, and with your new book in my hand I am hoping to keep on pushing the grades in years to come!